Dr. Frank Fuscaldo, Jr. attended Rutgers University-Newark before attending Life Chiropractic College in Marietta, Georgia. Dr. Frank graduated from Life Chiropractic College in December, 1993 and has been a licensed Chiropractor in New Jersey since 1994. In September of 2006, Dr. Frank began a 2 year Master of Science (MS) program for Applied Clinical Nutrition. He graduated in 2008 with a Master of Science Degree in Applied Clinical Nutrition from New York Chiropractic College. In 2008, Dr. Frank also successfully passed the national examination given by the Certification Board for Nutrition Specialists and became a Certified Nutrition Specialist (C.N.S.). He is also a Diplomate of the Chiropractic Board of Clinical Nutrition (D.C.B.C.N. ), and Board Certified Clinical Nutritionist. Dr. Frank successfully completed a training program in 2015 to become a Science Based Nutrition ™ affiliated practitioner. 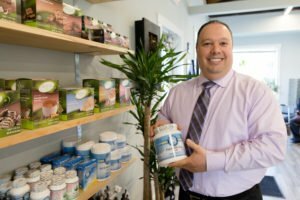 He has been a member of the Association of New Jersey Chiropractors (ANJC) since 2014 and a Professional Member of the American College of Nutrition (ACN) since 2015.